A superb over sized 19th century Mahogany Dial Clock by J Smith & Sons of Clerkenwell, London. Having a 16 inch dial and signed by J Smith & Sons, housed behind a fine quality cast and lacquered bezel and retaining the original bevelled glass. The finely hand carved surround made from solid dense mahogany with super colour and lustre, no repairs or replacements. With a 8 day single fusee movement of which retains the original pendulum, chain and key. Wonderful condition and quality throughout. English, London, Circa 1860. J.Smith & Sons of St. John's Square,Clerkenwell were one of the leading Clerkenwell clockmakers, making all varieties of clocks from the smallest timepieces to the largest turret clocks. They were particularly well known for their turret clocks, which were sent all over the world, and for their skeleton clocks, many of which were supplied partly finished for completion by other 'makers'. It is easy to confuse this company with S. Smith & Sons (Smiths Industries) and J. Smith & Sons of Derby, also famous makers of turret clocks. The company started in 1780 and by 1830 they were in St John's Square, Clerkenwell, were they remained until the late 1980's. 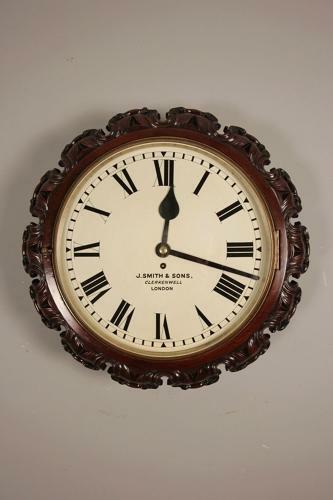 By 1851, John Smith and Sons were one of the top half a dozen largest clock makers in England and at the 1851 Great Exhibition, they exhibited a year going calendar clock and another chiming clock, chiming on 8 bells and striking on a gong. In 1865 their catalogue of the items they supplied showed an amazing collection of clocks available from illuminated exterior clocks to skeleton clocks, such as those based on Litchfield Cathedral and York Minster. The company were also now supplying raw parts to other makers and repairers and skeleton clock kits that could be assembled at home. 50% of all skeleton clocks supplied in the UK in the late 1800's were from J Smith & Son and J Moore & Son of Clerkenwell. There are even skeleton clocks by J Smith & Son in the Royal Collection belonging to the British Monarchy.